Blogger has an app for iPhone and it’s better than the corresponding Android app, which has improved a lot in the past months. Both apps let you edit your existing posts and create new posts, add images to your posts, include labels and geolocate your posts. They’re pretty basic, but the iPhone app has a better interface, it’s easier to use and pays attention to detail. For example, the iPhone app includes the URL of the blog next to the name when you switch to a different blog, so that it’s easier to identify a blog. The Android app only shows the names. To publish a post in the iPhone app, you need to tap the “Publish” button, which is always displayed at the top of the screen. In the Android app you need to scroll to the bottom of the post to find the “publish” button. “With the Blogger app, you can write a new blog post and publish it immediately or save it as a draft right from your iOS device. You can also open a blog post you’ve been working on from your computer and continue editing it while you’re on-the-go. 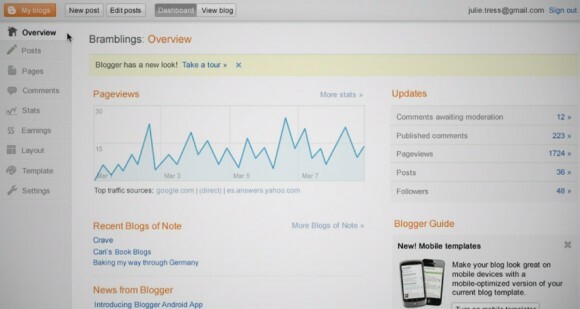 Your blog posts are automatically synced across devices, so you’ll always have access to the latest version,” informs Google. Google rarely preannounces new features, so I was really surprised to see a video that highlights some upcoming Blogger features. Google’s video does a great job at enumerating the latest Blogger improvements, while asking people: “Have you looked at Blogger lately?”. 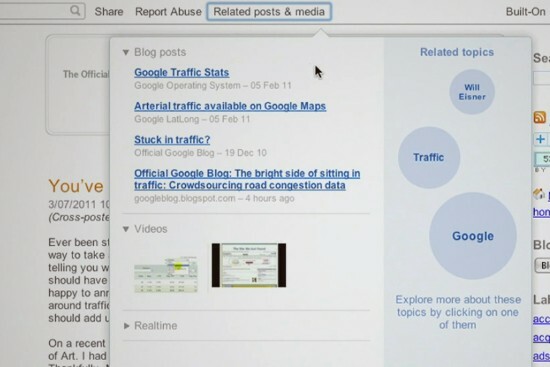 Google plans to unveil a completely new Blogger interface, mobile templates for blogs (which are already available at Blogger in Draft) and a feature that lets you find related posts and videos. In March, we Google launched the Blogger Template Designer on Blogger in Draft, its experimental playground where you can try out the latest features Blogger has to offer. Today we’re excited to announce that the Blogger Template Designer has graduated from Blogger in Draft and is now available to everyone by default. Blogger Template Designer is a way for you to easily customize the look of your blog without knowing any HTML or CSS. You can select from a variety of templates, images, colors and column layouts to make your blog an expression of you. See our post on Blogger Buzz for the highlights on this new tool. You can try the Template Designer on your blog now by going to the “Design” menu, then selecting “Template Designer.” Even if you don’t have a blog — or weren’t planning to redecorate the one you have — you can try out the Blogger Template Designer and play around with potential designs. If you like one, you can apply it to a new blog or to an existing blog. If you want to learn more on how the Blogger Template Designer can help you create your own unique blog designs, watch our video and check out the Blogger Buzz blog. Google is calling testers to test usability of its Blogger service feedback on something that’s currently in development. “We’re currently scheduling participants for a 60 minutes study that takes place June 17-23, 2010. Sessions will be remote – basically we’ll call you on phone and set up a screen sharing session with you on your computer. You’ll need a high-speed Internet connection (DSL, Cable, T1), a PC running Windows 7/Vista/XP/2000, must be at least 18 years old, speaker phone or hands-free headset, must allow to video or audio record the session,” Google writes. 2.Scroll down to where you see ]]></b:skin> tag . 3.Copy below code and paste it just after the ]]></b:skin> tag . 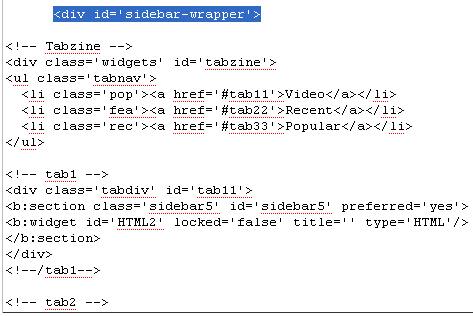 5.Now copy below code and paste it just after <div id=’sidebar-wrapper’> . 7.Go to Layout–>Page Elements.You can see your tab widget as the picture below. If you have a blog at blogspot.com and decide to switch your hosting to wordpress.com you can import all the posts and comments by using the WordPress Import feature. The automated process also has import functions for LiveJournal, Movable Type and TypePad, or another WordPress blog hosted elsewhere. Although all the posts and comments get transferred, widgets in the sidebar are ignored. You would have to re-create those from scratch. 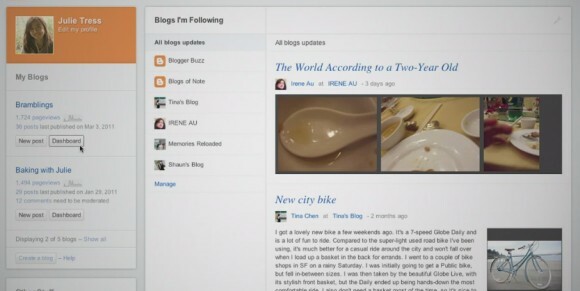 Blogger ‘Labels’ are preserved as WordPress ‘Categories’. Tools > Import. 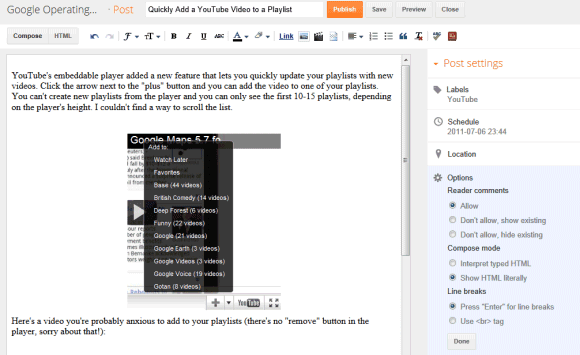 Then choose which blogging system you want to import from. Please note: To use the importer with Blogger you must have a Google account and an upgraded blog. 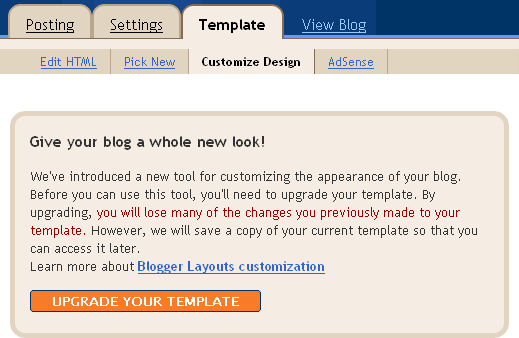 If you have an old-style Classic template you will need to switch to the new Blogger system (screenshot). The blog must be hosted on BlogSpot, not externally via FTP. It would be helpful to login to your Google Account before you begin the import process. Then you can simply click the “Grant access” button and continue. If you have more than one blog attached to a single Blogger account all of them will be listed with an “Import” button for each blog. The example below shows just one. On Blogger you have one username, and on WordPress another username. The author mapping process allows you to establish an association between the two usernames. Once these 3 steps have been completed the import proceeds automatically. “My Blogger blog was on an FTP-hosted site, so the first step was to temporarily convert that to Blogspot. That was easy to do inside the Blogger platform. I had more than 2,000 posts to move over to WordPress which was a problem because Blogger is capping the export at 500 posts now. Trial, error and Google searches taught me that I could export the whole thing to a WordPress hosted blog. So I simply created a MYURL.wordpress.com and exported everything from MYURL.blogspot.com – This was effortless. The next problem, though, came when I tried to export to a hosted www.myurl.com/wordpress/ site. The step is to save the data from the myurl.wordpress.com site on your machine as an XML file. This is easily done within the WordPress platform. The problem was in trying to export that from desktop to www.myurl.com/wordpress/ After two days in tech support conversations with the WordPress folks (who were VERY helpful) we decided that my ISP was timing me out. So what I would see after trying to export 2,000 posts would be 1,734 or 1,722 or 1,755. This got frustrating quickly. Especially while deleting them all, 15 posts at a time. The answer is a fairly simple one… … Take that XML file and segregate the data, perhaps by months or years if you’re dealing with thousands of posts, into several XML files to prevent the time out. WordPress’ tech people helped me break mine down into three XML files instead of the one I’d been trying and it all uploaded on the first attempt thereafter. Since before Blogger-in-Beta was launched Google ignored some quite basic features that were requested by users in Blogger’s “Features and Suggestions Wish List” (replaced with a Google Group). 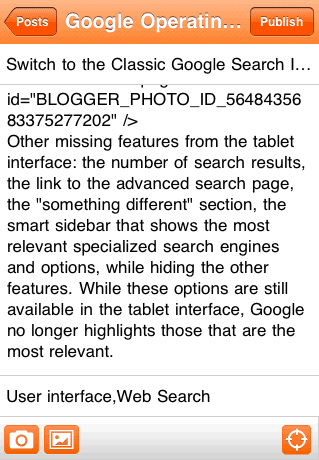 No static pages, no post excerpts and no ‘import’ feature, except from another Blogger blog. 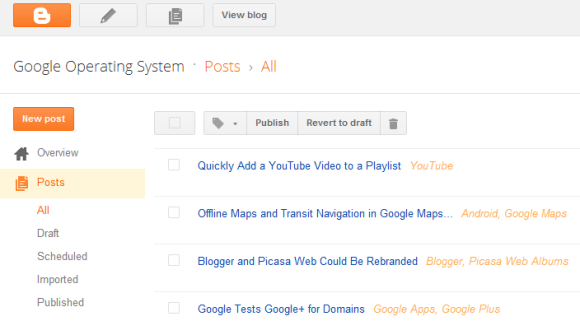 The Blogger development team have spent a lot of time on script-dependent widgets and gadgets for the sidebar. Someone should remind them that content is king, not gimmicks. 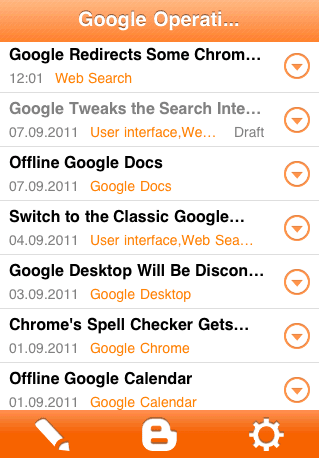 Widgets are nice, but it looks like “add-on” scripts are a higher priority than basic features. I got fed up with a constant stream of spam comments for deletion in my WordPress dashboard. Especially as there were very few genuine comments for moderation. It’s true that if you ignore the Akismet spam queue they’ll be deleted automatically after a while, but it’s difficult to ignore them as a few might have been falsely tagged as spam. Blogger makes it easy to change fonts and colors in themes. At WordPress.com you have to pay for an upgrade before you can do that.